Ultra recommendable? 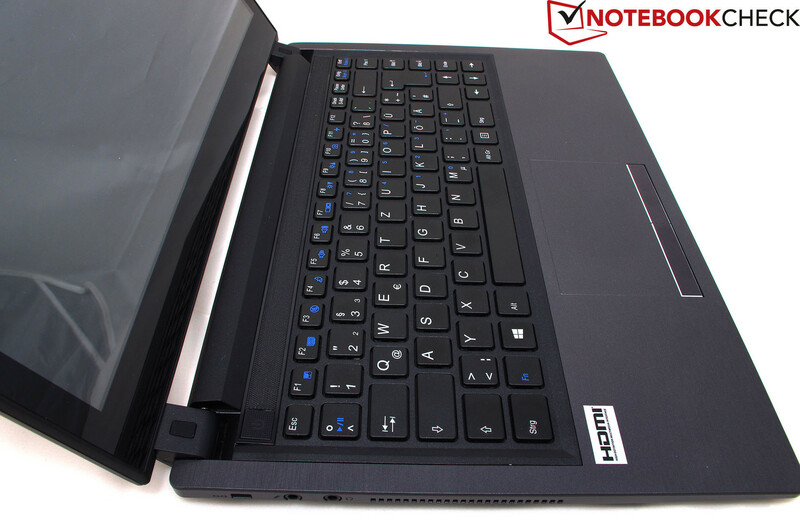 Now that more and more laptops feature touchscreens, Nexoc does not want to fall behind and sends a slim ultrabook based on a Haswell ULV CPU with a touch-sensitive screen dubbed B401 Ultra into the race. 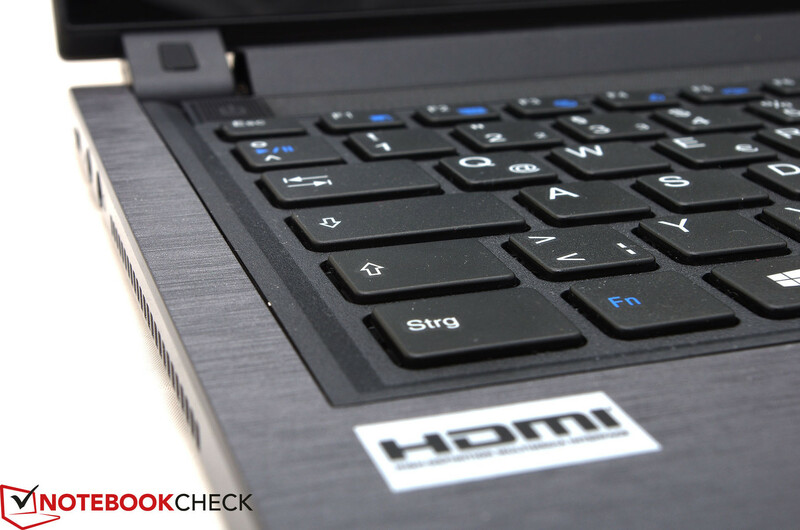 Read in the following test report whether the touchscreen-laptop convinced us. Smartphones, tablets, and now laptops. All these devices revolve around finger usage. At least, according to manufacturers who produce laptops with a touch-sensitive screen. Nexoc, a supplier from Dachau, now also wants to win over "touch-hungry" customers with the B401 Ultra. The B401 is based on the W840SU-T from the Taiwanese company Clevo which is known for its freely configurable laptops. Consequently, the Nexoc B401 is also available in many different configurations that can be customized on Nexoc's site. Intel's Core i7-4500U ultra-low voltage processor alongside an integrated Intel HD Graphics 4400 is installed in our review sample. A generous 16 GB of DDR3 RAM supports the CPU. Data storage is managed by a 120 GB mSATA SSD from Mushkin as well as a 500 GB HGST HDD. The slim, 2.3 cm device faces business contenders in the form of Fujitsu's Lifebook E743 and, as a prime reference, Lenovo's ThinkPad X1 Carbon Touch Ultrabook in our tests. At first glance, the Nexoc B401 Ultra's appearance is slightly conservative and restrained due to its middle-gray plastic casing in brushed aluminum looks. However, the Clevo W840SU-T barebone is beyond reproach in terms of build quality. The base unit makes a very good and rigid impression; the chassis does not yield significantly anywhere even under selective pressure. The display lid's stiffness is also compelling. Even gaps and both the solid and cool feel contribute to the high-quality impression. 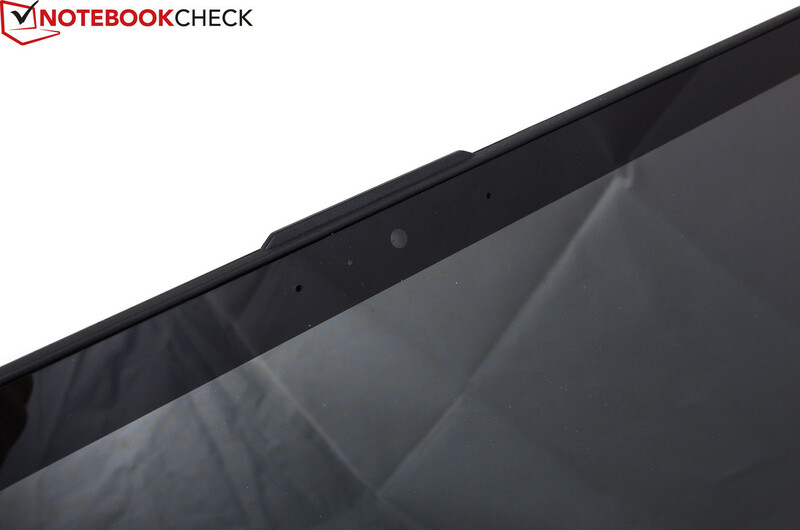 The relatively thick 14-inch touchscreen is kept in place by two tightly pulled hinges. Although that prevents opening the lid with one hand, it is an advantage on shaky surfaces, and particularly when using the touchscreen. The manufacturer Clevo does not give its W840SU-T an abundant supply of ports. 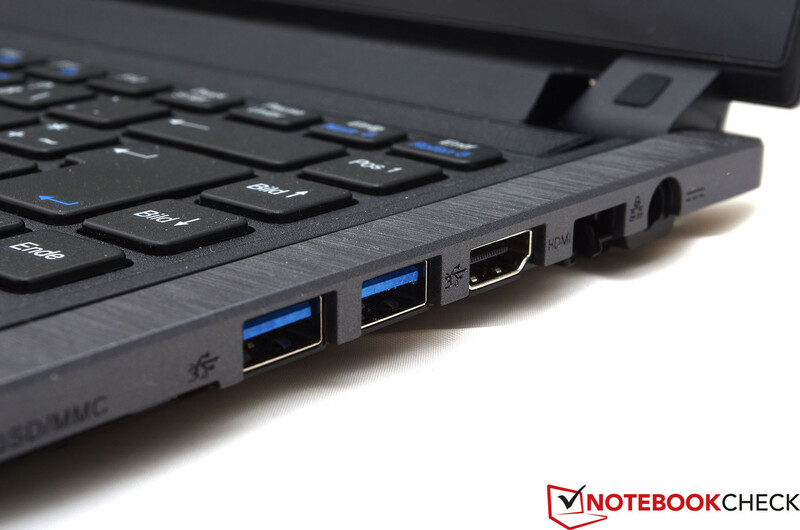 We only find two USB 3.0 ports on the B401 Ultra, which are directly beside each other. Somewhat bigger USB plugs (e.g. UMTS sticks) will cover the neighboring port and consequently prevent simultaneous use. We also missed the omitted VGA port that is still frequently needed for older monitors, and in particular projectors. However, this "drawback" can be easily remedied with an adapter. Most ports are located on the front right side, which will not be ideal for right-handed mouse users. However, left-handed users will not be very happy about the fan that blows waste heat out of the casing's left. The B401 Ultra sports an Intel Wireless-N 7260 module for wireless network connections besides a foldout Ethernet port (Realtek PCIe GBE Family). The Wi-Fi module presented a surprisingly poor performance in the author's individual test scenario using a D-Link DIR-600. The signal strength dropped to 1-2 bars and the connection was even interrupted occasionally at a distance of 8 meters and through one wall. The data transfer rate of 300 kbit/s can also only be called absolutely insufficient. Since the Wireless-N 7260 is not known for such problems, we presume that the error source is likely to be the antenna. The manufacturer is restrained with included accessories. Besides the 65 watt power supply, Clevo only adds a thin user's manual, warranty leaflet and one driver CD for its W840SU-T. 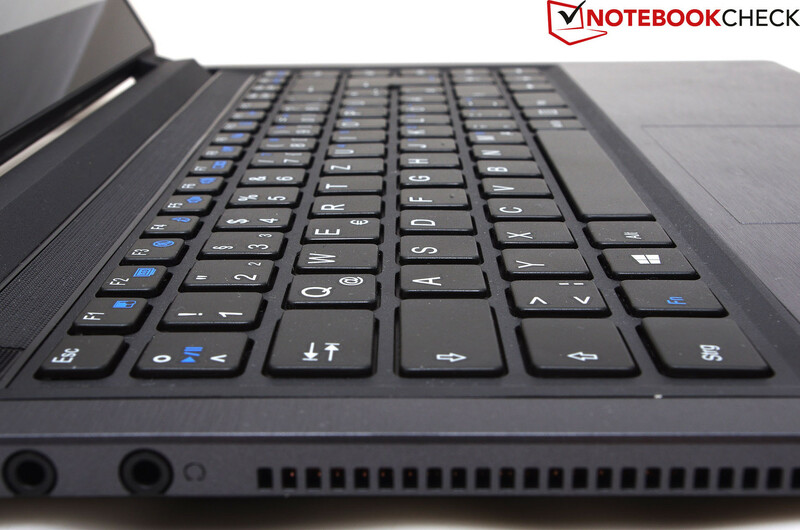 Maintenance has always been one of the biggest assets and plus points of the barebone laptops. The Clevo W840SU-T is no exception. 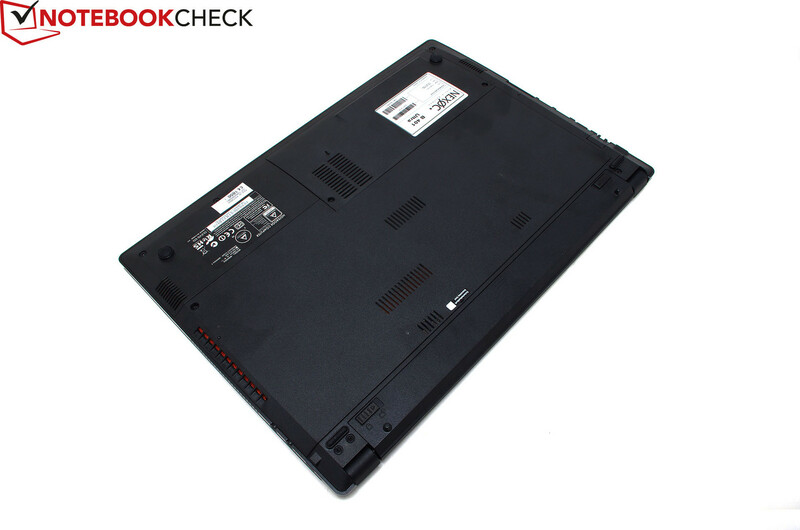 Two maintenance covers enable accessing the laptop's innards quickly and easily and allow upgrading the RAM and hard drive or SSD, as well as cleaning the cooling system. Note: We could not take pictures without risking damage due to a jammed maintenance cover in our review sample. Nexoc includes a standard manufacturer 24 month warranty with bring-in service on the B401. An optional warranty upgrade to 36 months (plus 65.45 Euros, ~$88) or a 24 month pick-up service (plus 24.87 Euros, ~$33) can also be added to the order. 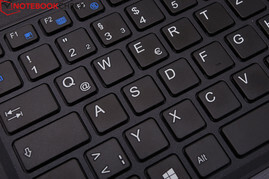 Nexoc installs a conventional black chiclet-style keyboard in its B401 (stand-alone keys). The typing feel can be called allover pleasant, although the soft, slightly spongy stroke lacks a bit of feedback. However, the input device reaps in plus points for its quiet typing noise. A minor drawback: The B401 does not feature a keyboard backlight. The generously sized touchpad blends into the looks of the surrounding plastic wrist rest. This has been solved pleasingly for the eye. The input device's quite rough surface needs a bit of familiarization and is not ideal for gliding. However, the responsiveness is very high and quite accurate. Also good: The dedicated mouse buttons that enable accurate use without looking. Nexoc installs a touch-sensitive screen in the B401 as a third input option. Technically, the screen makes a good impression owing to short response times and an accurate detection of the different multi-touch gestures using up to ten fingers. It is ultimately up to the buyer just how much sense this additional input option makes. In our opinion, the highly reflective screen cancels out the touchscreen's only marginal added value. An optional, matte screen would have been a welcome alternative. Clevo uses a multi-touchscreen with either 1366x768 or 1920x1080 pixels in its W840SU-T. Unfortunately, Nexoc obviously only offers the first alternative, which is also found in our review sample. It renders a somewhat grainy picture in a still sufficient resolution on the 14-inch screen. As usual for touchscreens, the TN screen model AUO 243C has a reflective surface (glossy). A look at the technical specs and rates do not cause exultation. Quite the opposite is true: A maximum brightness of just 146 cd/m² is far below average. The black value of 0.64 cd/m² and contrast of 205:1 are also on the same low level and cannot render a vivid picture even subjectively. Black looks like dark-gray. The illumination of 78% is still acceptable. 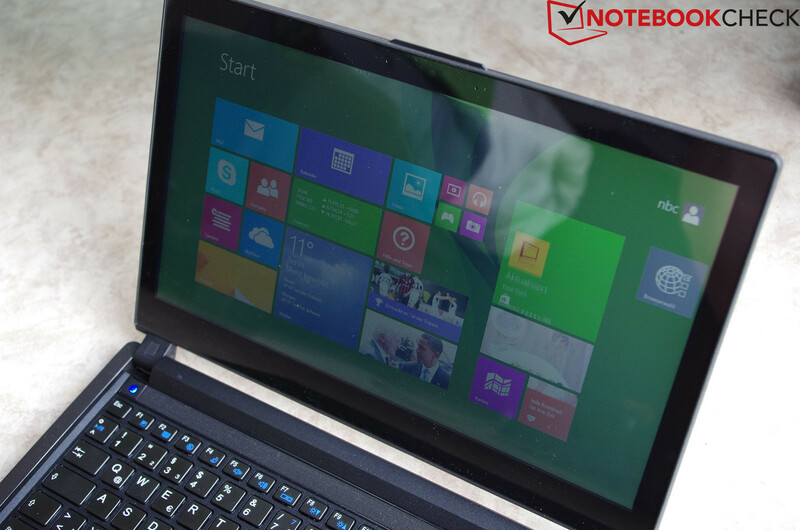 The multi-touchscreen in Nexoc's B401 Ultra is in no way recommendable for photo editors. 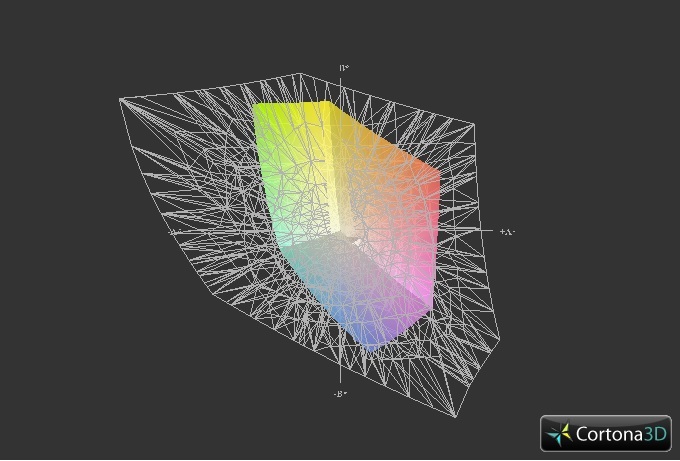 A color space coverage of 37.6% (AdobeRGB) and 54.9% (sRGB) is fully insufficient for reproducing true colors and is located in the below average field. 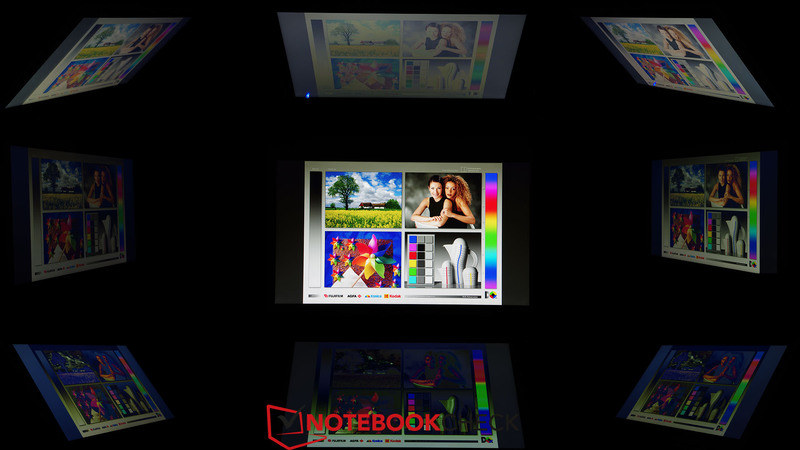 Fujitsu's Lifebook E743 does not sport a touchscreen, but scores with its more outdoor-suitable, matte surface. 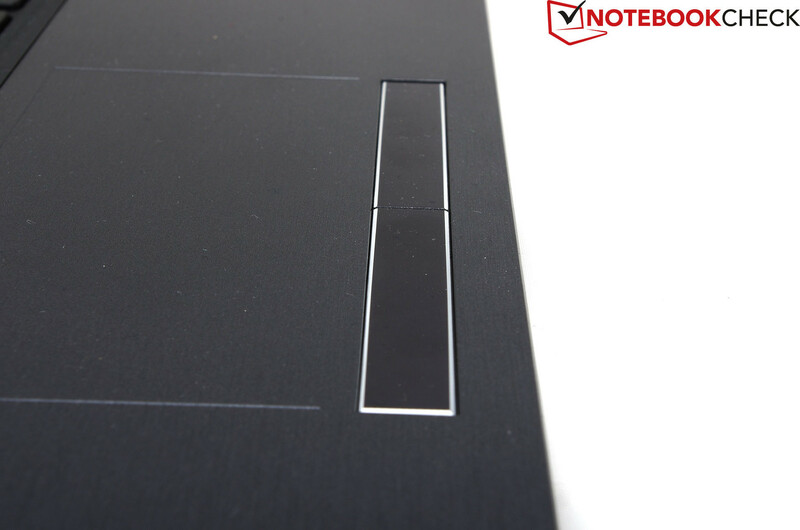 The good, though not outstanding TN touchscreen in Lenovo's Carbon Touch proves that this can be done better. However, it is also in a completely different price range. Primarily, two things are important for good outdoor suitability. First, a high brightness and second, a matte surface. Regrettably, the multi-touchscreen cannot score in either category. With only 61 cd/m² in battery mode alongside the highly reflective screen, the display only remains legible to an extent outdoors, even in very cloudy conditions (see screenshot). The touchscreen in the B401 is absolutely unsuitable for outdoor use in brighter surroundings, not to mention in sunlight. It looks pretty much the same with the viewing angles of the AUO 243C TN screen. They are poor as is known from this quality class. 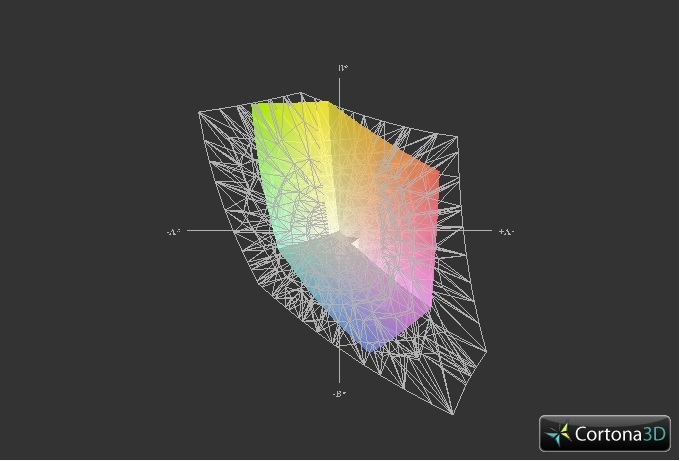 Obvious color deviations occur when just looking at the screen from a slightly slanted position. Additionally, the massive brightness loss both horizontally and vertically worsens the image and makes it virtually impossible to use the screen from these viewing angles. 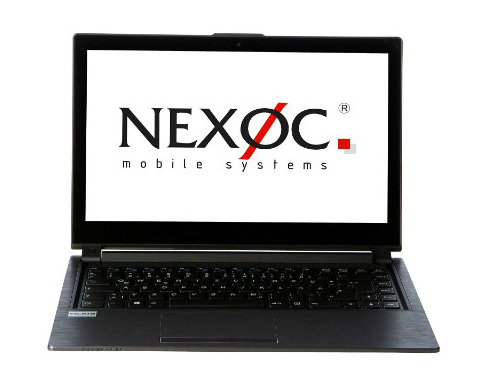 Nexoc equips its slim touchscreen-laptop with the latest Haswell ULV processor generation from Intel. 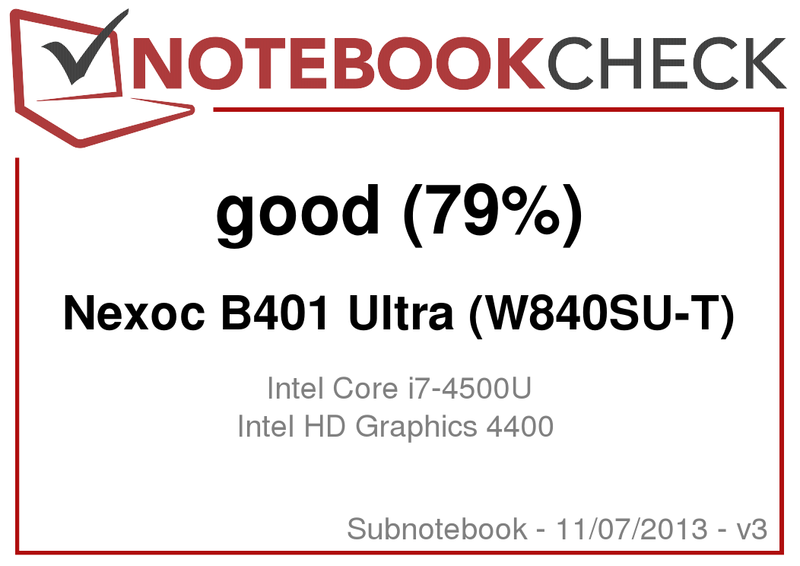 In addition to the Intel Core i7-4500U installed in our review sample, the i5-4200U is also available. 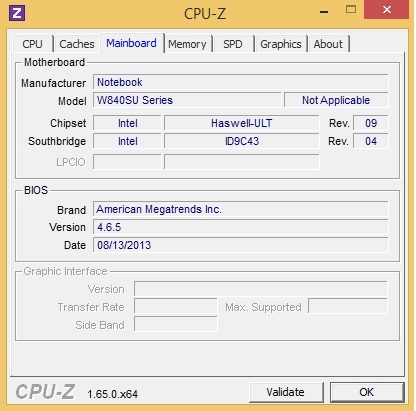 The CPU features the integrated Intel HD Graphics 4400 graphics unit. 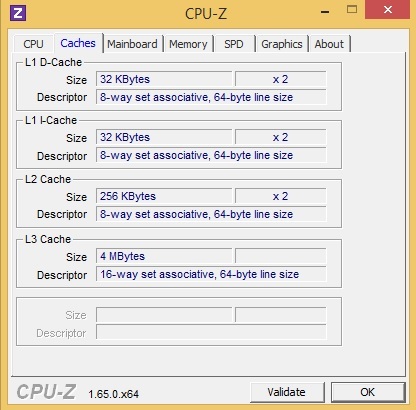 A generous 16 GB of DDR3 working memory from Kingston supports the system. It works in dual-channel mode with 2 x 8 GB. An HDD from HGST with a capacity of 500 GB and the mSATA SSD dubbed Mushkin Atlas 120 GB store data. The ultra-low voltage (ULV) processor Intel Core i7-4500U takes care of central processing assignments. With a TDP of 15 watts, the dual-core CPU produces considerably less waste heat than its standard voltage counterparts and spares the 44.6 Wh battery with its low energy-hunger. The i7-4500U has a clock rate of 1.8 GHz that can be increased up to 3.0 GHz (single-thread) via Intel's Turbo Boost. In our Cinebench Render benchmarks the CPU achieved clock rates ranging from 2.4 to 2.7 GHz (multi-thread) and 2.6 to 2.8 GHz, with only short peaks to 3.0 GHz in single thread. The CPU disabled the Turbo in battery mode and clocked with 1.8 GHz. An evident performance difference of 60 to 75% is seen when compared with similarly equipped devices from the multimedia category, such as the low-priced Medion The Touch 300 (Akoya S6212T) featuring an i3-4010U. 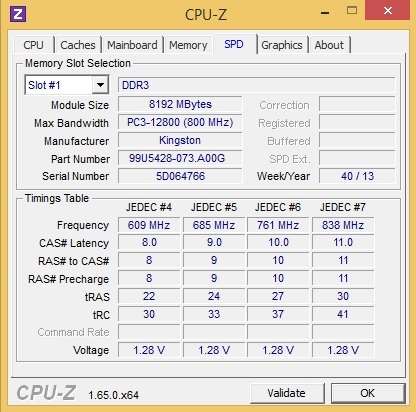 An identical i7-4500U in Acer's Aspire V7-582PG is on the same level with minor fluctuations. We used PCMark Vantage, PCMark 7 and the new PCMark 8 to assess the system's performance. According to the recorded results, the Nexoc B401 Ultra is on the expected good level. Particularly the swift SSD alongside the generous 16 GB of working memory (1600 MHz DDR3; dual-channel) contribute to the good system performance. 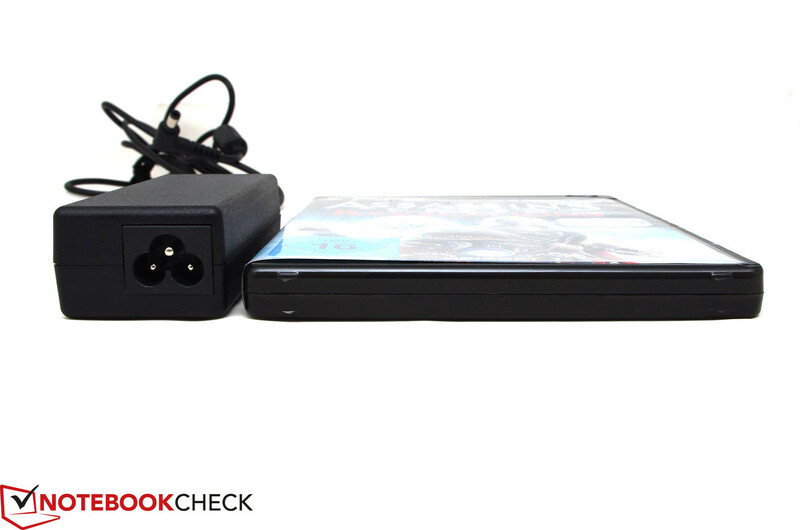 Data is stored on an array of a conventional HDD and an SSD drive. The hard drive from HGST spins with 7200 rpm and has a storage capacity of 500 GB for pictures, videos or games. 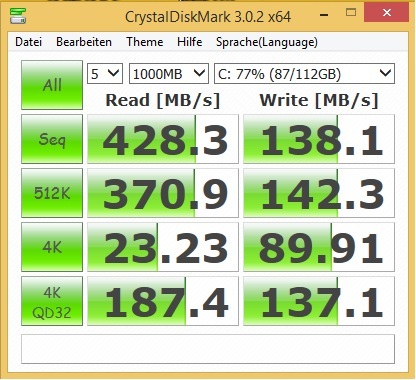 The 120 GB Mushkin Atlas SSD is connected via the mSATA slot and has room for a few other programs besides Windows 8 64-bit. The processor-integrated Intel HD Graphics 4400 iGPU calculates graphics. 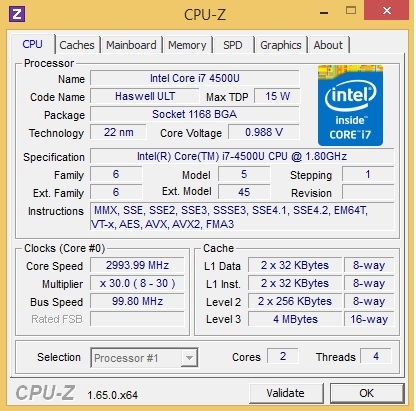 The Haswell successor of last year's Intel's HD Graphics 4000 clocks within a range of 200 MHz (idle) to 1100 MHz and now has 20 Execution Units (HD 4000: 16). The HD Graphics 4400 uses up to 1.7 GB from the 1600 MHz DDR3 RAM as graphics memory. The latest CPU generation has particularly improved in terms of graphics performance. 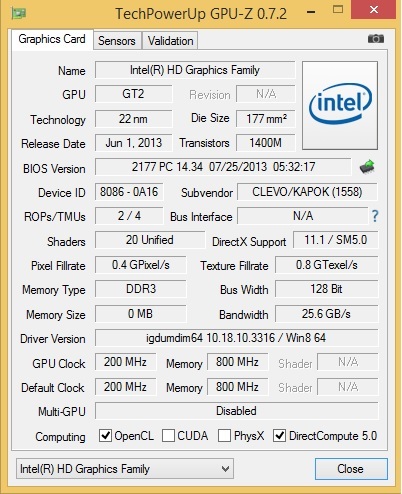 The HD 4400 demonstrates this considering the results we ascertained from a comparable Ivy Bridge model (i7-3517U). The Haswell unit achieves an advantage of 37% in 3DMark06, and the increased graphics performance is even a whole 67% higher in the less processor-heavy 3DMark 11. 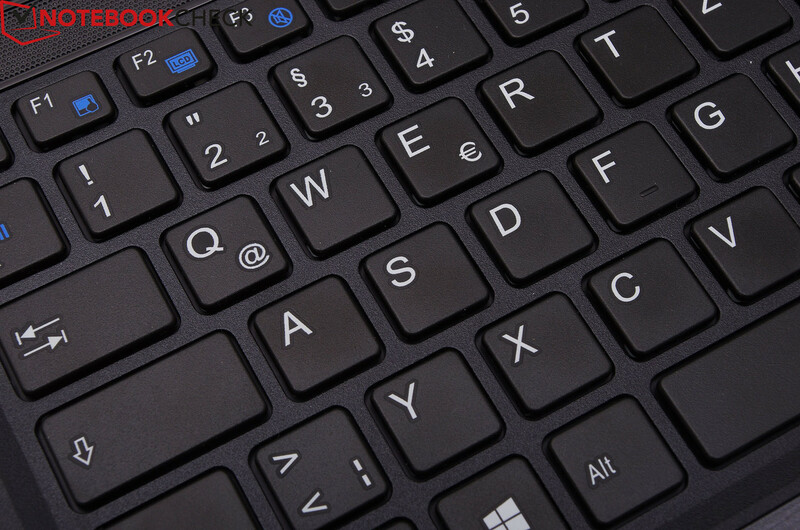 The i7 also surpasses its i3-4010U sister model in The Touch 300 (Akoya S6212T) multimedia laptop by 20 to 30%. A big performance difference becomes evident when compared with a dedicated GPU, such as Nvidia's GeForce GT 750M in the Aspire V7 (see chart). 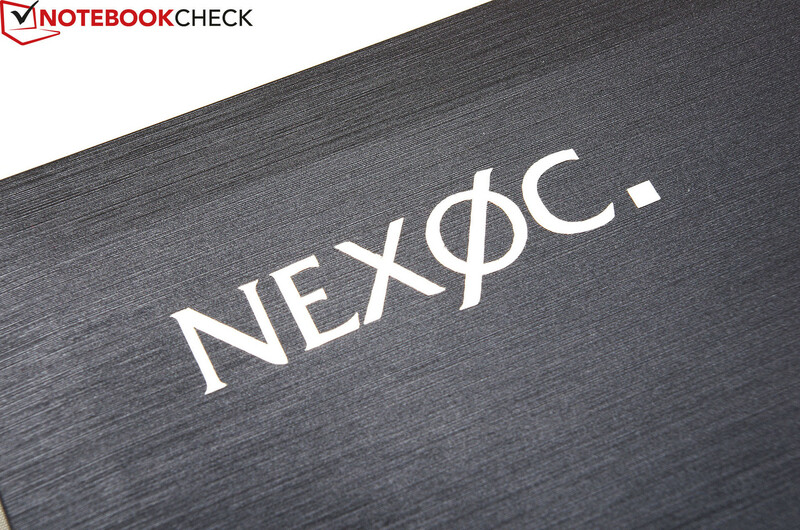 Our gaming benchmarks confirm the synthetic graphics assessments and make clear: Nexoc's B401U is not a gaming laptop. Although the HD 4400's speed has increased compared with its Ivy Bridge precursor, the ULV iGPU is still too weak to render up-to-date PC games in appealing looks. Users who are satisfied with less graphical beauty can nevertheless enjoy smooth frame rates in some titles using low details and resolutions. The 14-inch laptop wins the comparison with Medion's Akoya S6212T (i3-4010U), even if only marginally. Acer's Aspire V7-582PG with a GT 750M might be a powerful, but also slightly more expensive, alternative for users who want to play a bit more intensely on their touchscreen-laptop. The noise emissions leave us with mixed feelings. The Nexoc B401 runs mostly quietly and with a barely audible 30 dB in low load. A small drawback is that the fan occasionally speeds up only to drop to its lowest level again. 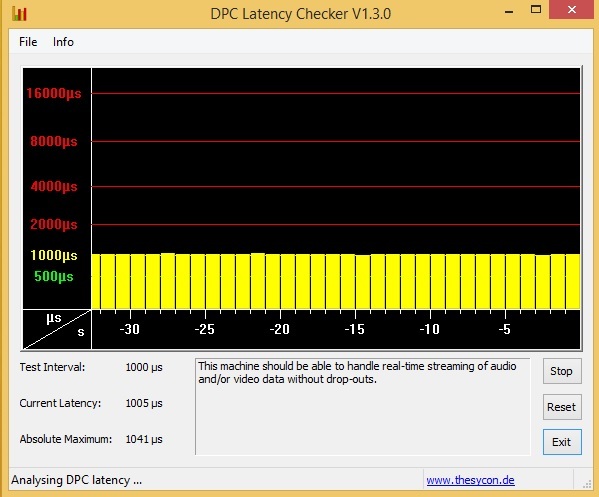 This changes during load and the 14-inch touchscreen-laptop gets relatively loud with up to 43 dB (stress test). 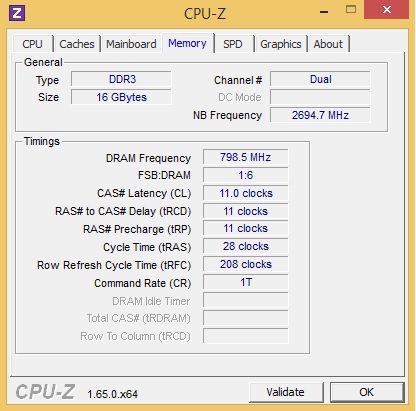 Fujitsu's E743 is on a par in idle but scores with a somewhat lower noise level during load. 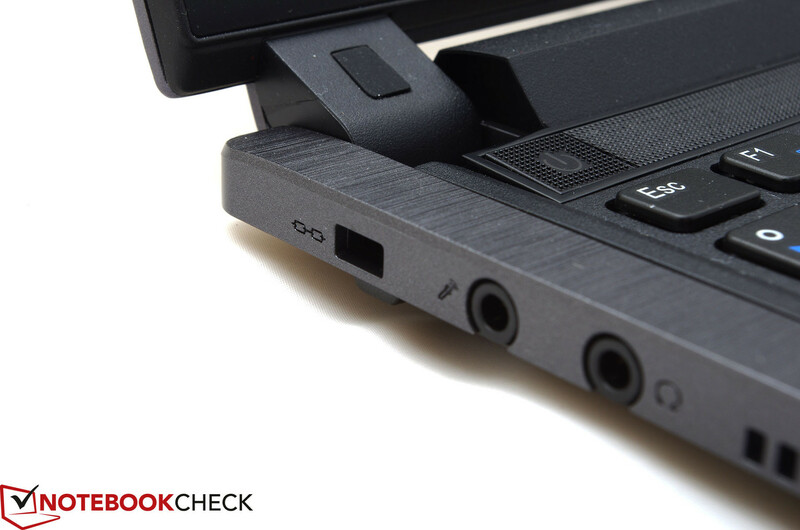 Lenovo's X1 Carbon Touch is the least noisy in load. 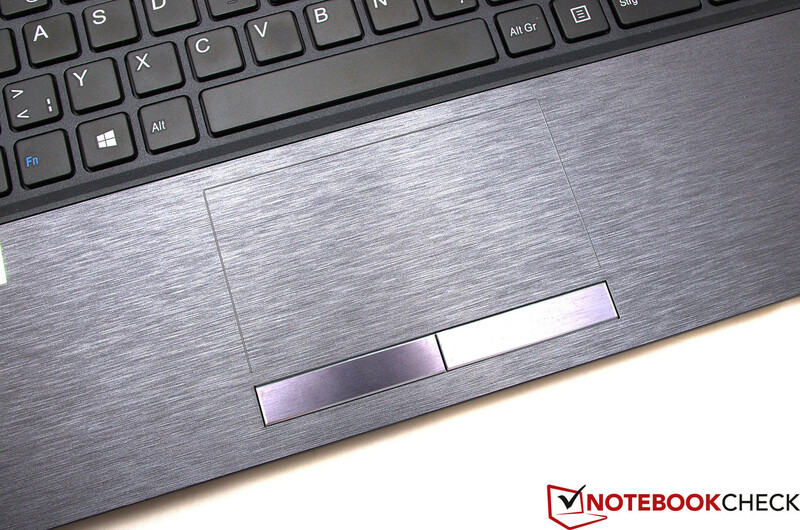 When idling, the temperatures of the Nexoc B401's casing are absolutely within an acceptable range, and on the same level as Lenovo's laptop but slightly below that of the E743. 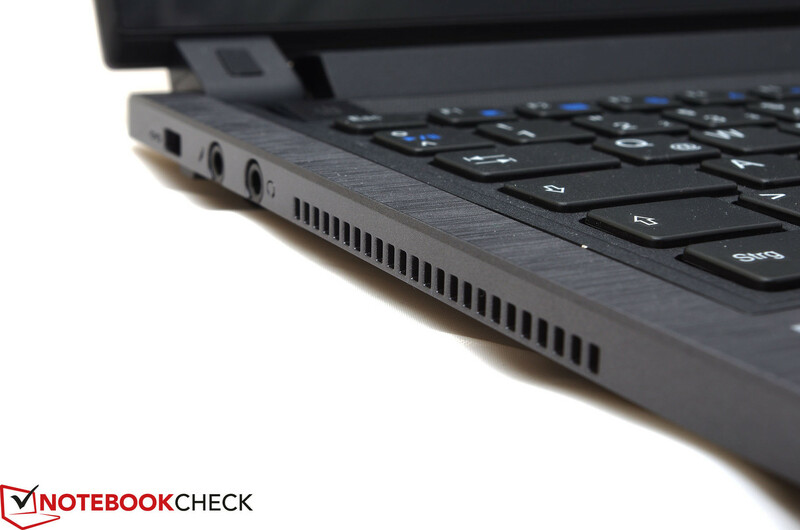 The temperatures increase up to 53 °C in load, which largely correspond with the X1 Carbon Touch. The E743 remains a bit cooler here. The hardware temperatures are on an absolutely uncritical level with up to 78 °C, although these temperatures are achieved by throttling the clock rate to 1.8 GHz in the stress test. (-) The average temperature for the upper side under maximal load is 39.5 °C / 103 F, compared to the average of 30.7 °C / 87 F for the devices in the class Subnotebook. (-) The average temperature of the palmrest area of similar devices was 28.6 °C / 83.5 F (-9.4 °C / -16.9 F). The B401 Ultra's stereo speakers are located above the keyboard underneath a sound bar. They produce an acceptable sound that is quite sufficient for video calls and a bit of music. The fairly thin sound with barely any low ranges, muddy mids, and unbalanced trebles will not fulfill any higher requirements. Headphones or external speakers are recommended for this purpose. 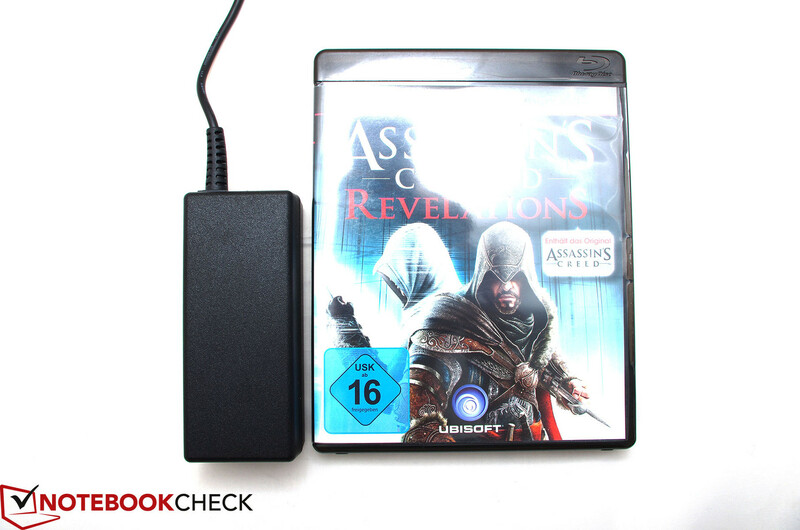 Our review sample's power consumption is, as expected, low. 4.7 to 9.2 watts in idle mode are within the category comparison, and are due to the 15 W ULV processor among other things. The load power consumption increases to a maximum of 35.1 watts. 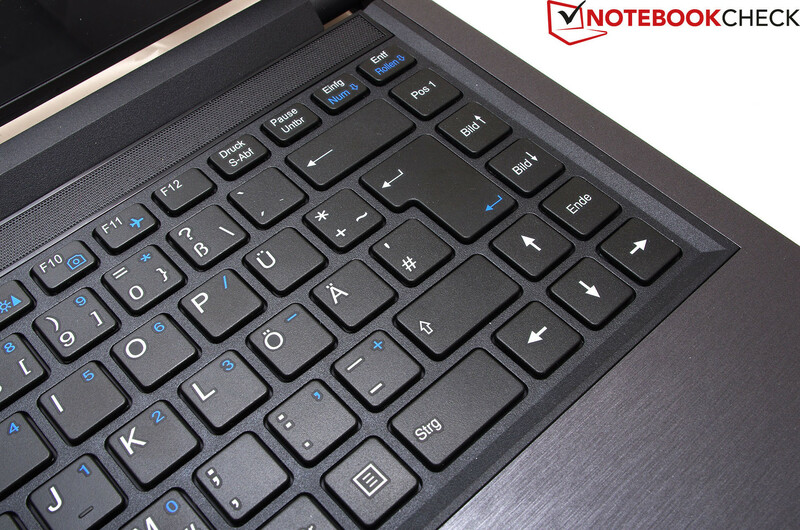 The E743 consumes considerably more with up to 45.9 watts due to its standard voltage i5-3230M, while Lenovo's X1 only requires marginally more power in both idle and load. The energy-efficient ULV processor and the relatively low consumption rates indicate a decent to good battery runtime. The B401 Ultra has a removable 4-cell, lithium-polymer battery with 44.6 Wh for use on the go. Battery Eater recorded a maximum idle runtime of approximately 7 hours. Lenovo's Carbon Touch surpasses this with almost 9 hours. The tide turns in load operation and the B401 gives up after 2:24 hours, which is a bit longer than its premium contender (1:55 h), while the E743 lasts for just as long (2:25 h). In the Wi-Fi test Lenovo's device again takes the lead, lasting 6:54 hours, knocking both the Nexoc (5:23 h) and the Fujitsu (4:28 h) down a peg. The Nexoc B401 primarily convinced with the rigid casing's good build and swift system performance owing to the generous 16 GB of RAM and fast mSATA SSD in our test course. The exemplary, comfortable configuration and maintenance options also let the Clevo barebone stand out from "off the rack" devices. However, one crucial element cannot be configured in the B401: The far below average brightness of the low-contrast multi-touchscreen. The B401 Ultra loses many points here, and unfortunately prevents us from giving it a clear purchase recommendation. We can only hope that Nexoc will add the Full HD multi-touchscreen that Clevo offers to its assortment, and that it will be more convincing with better image properties. We have to criticize Clevo's imperfect fan management as another minus point, which is almost tradition. The non-proportionate, high maximum noise even surpasses identically equipped devices with a ULV CPU and dedicated graphics card. 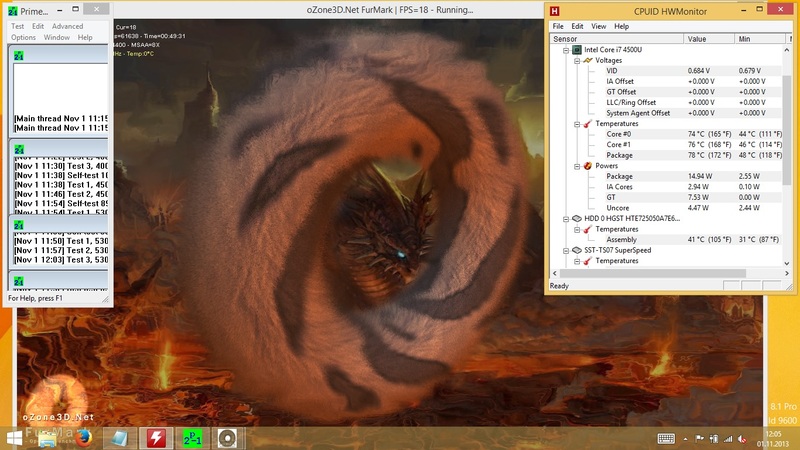 Talking about dedicated GPUs, users who want to play on their touchscreen-laptop should look closer at a device featuring such a graphics solution, e.g. Acer's Aspire V7-582PG. 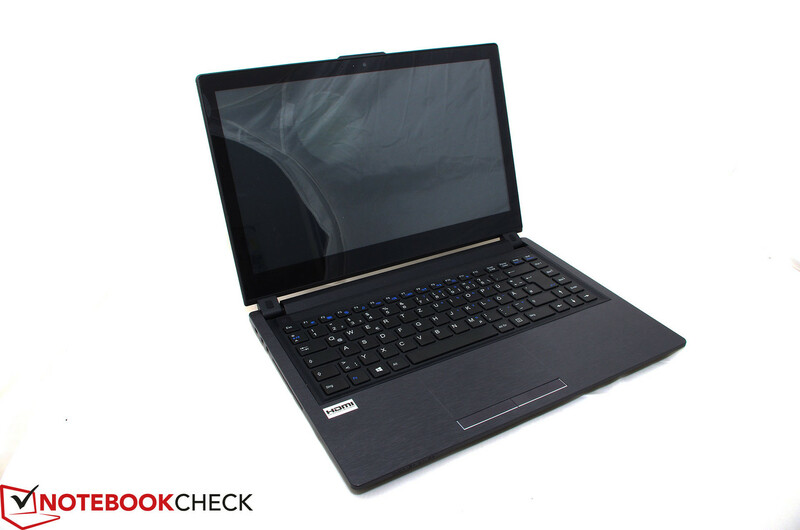 A handy 14-inch device featuring a touchscreen and Haswell ULV CPU. The gray casing conveys a slightly conservative, yet appealing impression. ...that is, however, highly reflective. The low-brightness, glare-type screen is only outdoor-suitable to an extent. ...USB 3.0, and an Ethernet port. The vent on the casing's left is not ideal for left-handed users. The chiclet keyboard makes a decent, though slightly spongy impression. The large keys enable good and quiet typing. The touchpad with dedicated buttons does an immaculate job. The solid and good build and the exemplary maintenance options. A brighter, contrast-richer and higher resolution screen. The high temperatures and loud noise in load.